Firing up a new virtual machine is smooth, straightforward and often done in just seconds, but to reach this point you have to invest some time and effort in setting up a nice and reliable cloud environment. There are a lot of things to do. You have to prepare some images having a operating system installed, you have to take care about your DNS records, put some SSH Keys into your fresh virtual machine and install some useful software on top of it like an Apache web-server etc. 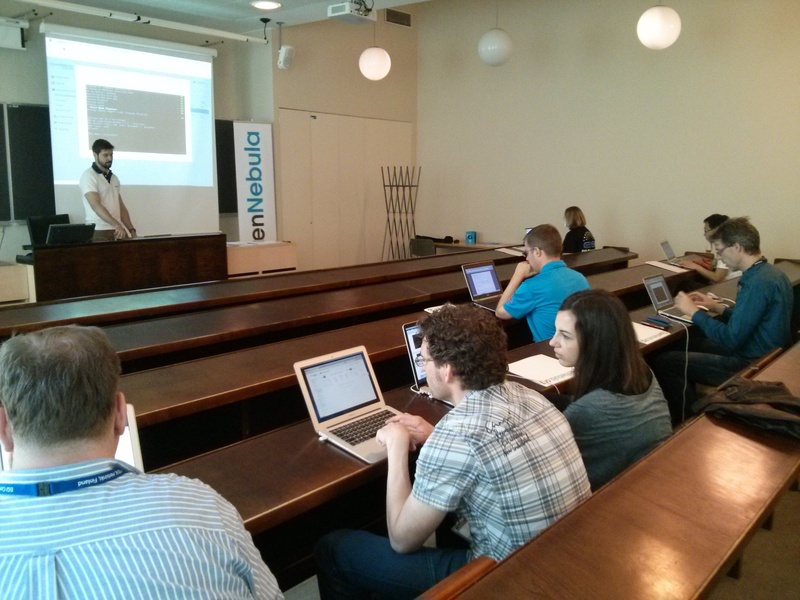 For automating these tasks OpenNebula does provide hooks and contextualization for it. We at Netways have been using the Foreman in combination with Puppet for doing all these tasks on bare metal systems and now implemented a compute resource functionality for the Foreman project. It can be used to deploy virtual machines within OpenNebula using the Foreman interface which configures DNS,DHCP,PXE,Puppet and so on as well. The functionality is covered by using and extending the ruby fog library. The idea is to create a blank (empty datablock image) VM via Foreman in OpenNebula, which then will be fully deployed from scratch. Installation will be done with a PXE-Boot and Kickstart/Preseed installation. Additional software on top like Apache and stuff like that will be installed and configured with Puppet. Everything can be chosen via the Foreman interface which interacts with all infrastructure elements. Also it would be possible to use contextualized prepared images, but we did not implemented it yet. We are using this feature for some days right now in production and it is really cool. It definitely will and should not replace the Sunstone interface, its just a interaction via the XMLRPC API of OpenNebula. Every feedback is very welcome and contribution or help for getting it pushed to the master branch of the projects (Foreman, Fog) is of course appreciated. For further information or questions leave your comments below. 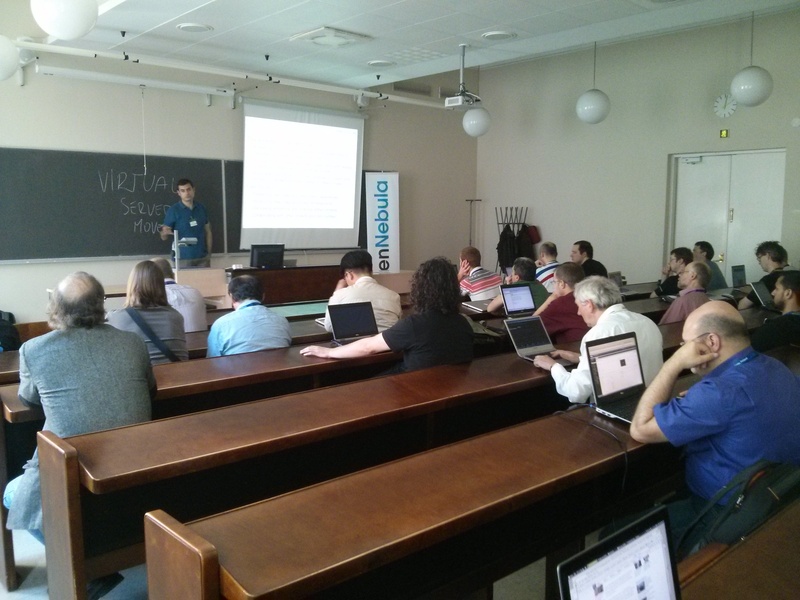 Last week was the EGI Community Forum 2014 in Helsinki. 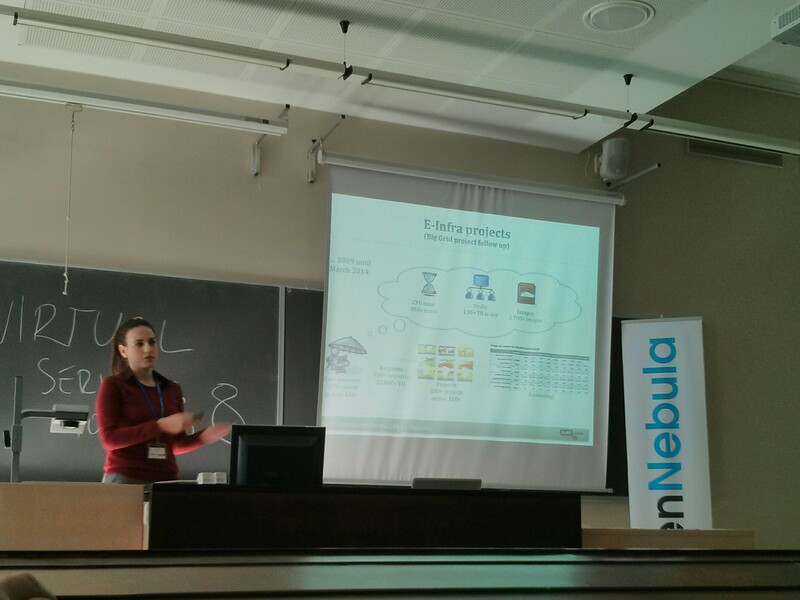 The OpenNebula in Science/HPC workshop was full of interesting talks about OpenNebula clouds for HPC. Thanks to all the speakers for sharing their use case and their feedback. One of the most commented areas where OpenNebula is still a bit short in features is accounting. Currently people need to parse the accounting output to generate their own reports, but this is precisely something we are already working on. You can try the accounting widget right now in release 4.6.1, which we will continue improving for the next 4.8 version. 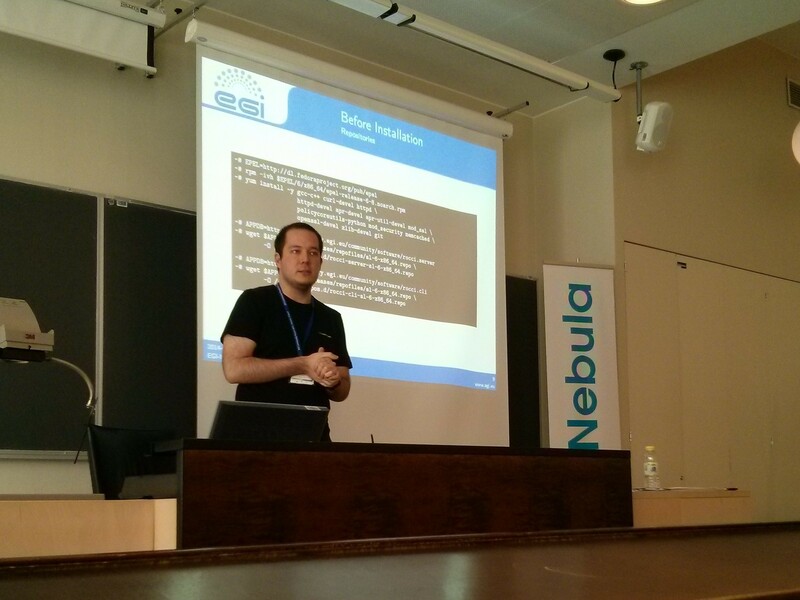 On Friday we held the tutorial to build an OCCI-compatible OpenNebula cloud. The attendants were happy to have a more technically oriented session, and all of them were able to build their small cloud in their laptops. You can download the slides from the workshop here and for the tutorial here. If you do so, you should definitely reserve a bit of time from December 2nd to 4th and check out flights to Berlin/Germany, because this is when and where cool things will happen. We are looking forward to your talks and will come back to you by the end of CfP on July 15th. The OpenNebula Project has officially announced upcoming TechDay events in Boca Raton, Florida, on June 19th and in Fremont, California, on June 24th. These TechDays are free, full-day events for CIOs, CTOs, VPs of technology, IT directors, cloud architects, sys-admins and devops, featuring a hands-on workshop, as well as presentations from community members and power users. The event in Boca Raton will be hosted by TransUnion|TLOxp, global leader in information and risk management. The event in Fremont will be hosted by Hyve Solutions, a leader in providing large scale deployments of fully integrated racks of purpose-built data center solutions, and an original Open Compute solutions provider. During this event, attendees will have the chance to participate in the manufacturing plant tour of the Facebook OCP Racks. “We are happy to host the first Cloud TechDay in USA in our headquarters and present how we are using OpenNebula to deploy our on-premise cloud,”said Armando Escalante, EVP and Chief Technology and Product Officer at TransUnion|TLOxp. “The Bay Area Cloud TechDay will be an opportunity to discuss how our OCP Open Rack solution can be used in conjunction with OpenNebula to deliver a robust on-premise cloud solution,” said Steve Ichinaga, Senior Vice President and General Manager, Hyve Solutions. “We are excited to have these leading companies hosting our first community events in the States,” said Ignacio M. Llorente, Director of OpenNebula. OpenNebula TechDays are an excellent opportunity to meet peers with practical experience building clouds, to find out how leading companies are using OpenNebula, and to learn to design, set-up and operate private clouds. We are pleased pleased to announce the maintenance release of AppMarket 2.0.1. This is a maintenance release that solves issues reported by the community. This release is part of the AppMarket 2.0.x series, which extends the AppMarket functionality by adding a new set of features that enables the management and processing of OVA files. A new component AppMarket Worker is introduced, which handles the OVA package treatment (download, unpack, OVF parsing) and image format conversion. This release also features a new API, a new simplified import dialog, a new AppMarket interface via Sunstone, and handles VMware and VirtualBox OVAs. https://opennebula.org/wp-content/uploads/2018/11/opennebula_cloud_logo_white_bg-4.png 0 0 Jaime Melis https://opennebula.org/wp-content/uploads/2018/11/opennebula_cloud_logo_white_bg-4.png Jaime Melis2014-05-22 14:23:432014-05-22 14:27:07AppMarket 2.0.1 released! The graphical accounting information tab in Sunstone is worth highlighting. It is accesible for the end user through the Cloud View to check their consumption, and for the cloud administrator through the Admin View, where she can check accounting information for a particular virtual data center. For a more complete change log you can check the list of issues solved for this release. As always, make sure you read the upgrade guide before applying the new release. May 13th, 2014. The OpenNebula team is pleased to announce the final release of AppMarket 2.0. This release includes important features that are a direct result of feedback from production deployments. AppMarket allows you to build your own internal marketplace service. Your OpenNebula users will be able to import the appliances from your internal AppMarket service to their OpenNebula instance through a new Sunstone tab called AppMarket, reducing the time needed to jumpstart a OpenNebula deployment and also making it possible to quickly incorporate new services to the cloud offering. This release extends the AppMarket functionality by adding a new set of features that enables the management and processing of OVA files. A new component AppMarket Worker is introduced, which handles the OVA package treatment (download, unpack, OVF parsing) and image format conversion. This release also features a new API, a new simplified import dialog, a new AppMarket interface via Sunstone, and handles VMware and VirtualBox OVAs. OVA processing: If a URL to an OVA package is supplied, the AppMarket will be able completely process it and integrate it to its repository. This involves: downloading and unpacking of the OVA package, parsing of the OVF file and creating a corresponding OpenNebula template. This component supports VMware and VirtualBox OVFs. https://opennebula.org/wp-content/uploads/2018/11/opennebula_cloud_logo_white_bg-4.png 0 0 Jaime Melis https://opennebula.org/wp-content/uploads/2018/11/opennebula_cloud_logo_white_bg-4.png Jaime Melis2014-05-13 11:18:412014-05-13 11:56:07AppMarket 2.0 Released! are in fourth and seventh position, respectively, of the top cited publications in cloud computing. This demonstrates the pioneering work done by these two well-known and widely-used open-source projects and the maturity of their open-source products. 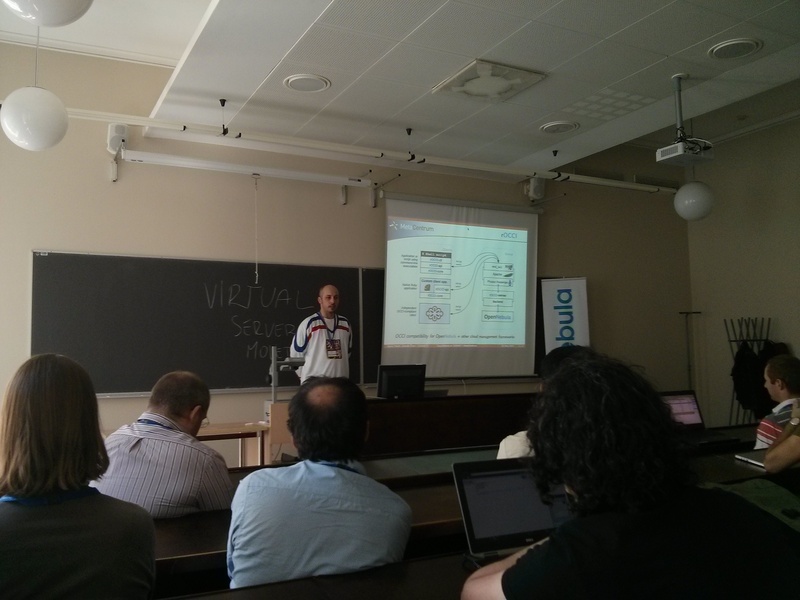 Next week we will be at the EGI Community Forum 2014 in Helsinki, Finland. And on Friday we have prepared a tutorial where you will install an OCCI-compatible OpenNebula cloud in your own laptop. If you are a devop or system administrator interested in a private cloud solution, don’t miss it! 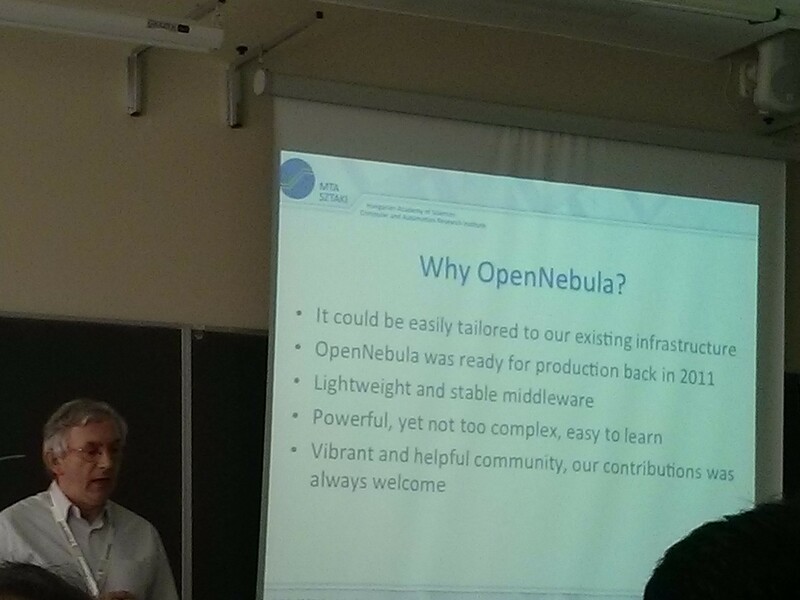 No prior knowledge of OpenNebula is required, although you should be familiar with Unix/Linux and virtualization. Even if you are already using OpenNebula, you might be interested in this tutorial since it will showcase the latest cloud provisioning portal introduced in 4.6, and the integration with OCCI.